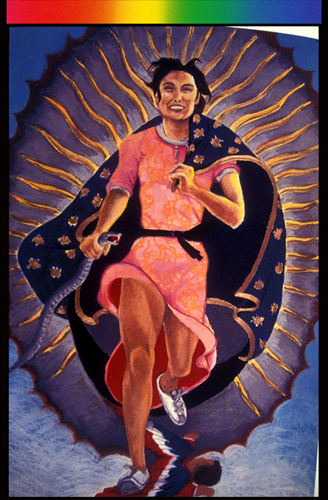 The image of Our Lady of Guadalupe was completed in 1978 by Yolanda Lopez. She did a series of images but this one is for activists today. notice her tennis shoes... moving on to new life, new visions....with women of today. Mother who protects us against danger, protect especially those most vulnerable from violence and oppression. Undocumented Virgin, enfold in your arms the undocumented immigrants in the desert’s wilds. Mother Most Vulnerable, fleeing violence and the injustice of rulers, fleeing through the desert, help us to become justice. La tele Virgen, "sustainer of life”, sustain those who are in despair, who have little hope, whose lives are stolen away by the callous rich, and the indifferent. Mother who "understands everything," become forgiveness in the hearts of those we have hurt or betrayed, become forgiveness in our own hearts. “Then came one named John, sent by God, who came as a witness to testify about the Light, so that through his testament everyone might believe”. Presider: As we gather together in this sacred place and share in this banquet of love, let us pray in the name of our God for us whom we call Creator, in the name of our God alongside us whom we call Jesus, and in the name of our God within us whom we call Spirit. Presider: My sisters and brothers, our Loving God is with you! ALL: O Holy One, in this journey into the heart of compassion, we celebrate your love as we see it. Open our eyes and hearts to the message of the Gospel so that your inspiration and peace may lighten our hearts, your justice guide our lives, and your love direct and support us in our concern and care for one another. You call us to recognize and warmly welcome everyone who comes through our doors as your presence among us, which they are. In communion with Jesus, our brother, and with the power of your Spirit, we will try to live the example of your love each day. Amen. Presider: Divine Mystery and Compassionate God to whom all hearts are open, no desires unknown, and from whom no secrets can be hidden, cleanse our hearts by the inspiration of Holy Wisdom. I have loved you with an everlasting love, I have loved you and you are mine”. Our readings today reflect the man, John, cousin of Jesus, the man who saw something extraordinary in the ordinary man, Jesus. He saw him as the One who was the Messiah whom prophets like Isaiah had foretold as coming to show us a new way of living one’s life. John seemed astounded that Jesus would come to him to be baptized, by saying simply, “I baptize only with water, but you baptize with the Spirit”. As I reflected on the relationship of these two cousins, who knew each other growing up, they attended the same family gatherings, and saw the goodness in each other. But John knew there was more. I think it was a growing awareness of Jesus and his goodness over the years and John so clearly saw this that day. It was his living faith and ability to see who Jesus was, that he became the first one at the beginning of Jesus public life to tell people: here is the One you have been waiting for, here is the One to follow. Listen to what he is teaching, watch how he lives his life, see how he loves. Because of his relationship with Jesus, John, by and through his life, encouraged people to follow Jesus. How then does this scripture have meaning for us today? What I take from this is, do we like John in the way we live our lives speak of whether or not we are followers of Jesus and all that he taught and stood for. Do our lives reflect Jesus? I’d like you to turn to the front page of today’s liturgy and look for the quote in blue letters. Now read it slowly to yourself, putting your name in place of John’s name. Read it twice, each time speaking your name. Can you believe this? Can you see yourself as being called by God for a special purpose in your life that only you can do? Is your life a “witness to testify about the Light” which is Jesus. Is your life such that “through your testament (the way you live your life) everyone might believe”? We believe in the Spirit, the one that inspires our innermost life. She keeps the Anointed One present to all those who are searching for meaning and wholeness in their lives. She strengthens our call to follow Jesus as a vehicle of God’s love. She is the one who helps us reach within ourselves so that we can heal and energize ourselves when our spirits may grow weary in our lives. Presider: That hearts in Washington are changed so that the innocent, terrified immigrant children will be reunited with their parents. Presider: Blessed are you, gracious God of all life, through your goodness we have this bread, wine, all creation and our own lives to offer. Presider: God is always with you. Presider: Together, we lift up our hearts. ALL: To God and one another we lift them. Presider: Together, we give thanks to our gracious God. ALL: Indeed it is right to constantly give thanks and praise. Voice 1: Gracious Wisdom, you embrace us with your extravagant affection in both our blessedness and times of weakness. You are always with us and live in us, and we in you. In this festive meal, your Spirit is poured out to each of us gathered in this circle of your disciples, to share your gift of shalom, our peace. Voice 4: And when his time on earth had come to a close, Jesus – aware of and accepting his destiny – gave up his life for the values that he deeply believed, lived and taught…his conviction that love is stronger than death. And then, in providing an example of this wisdom for all people in the ages to come, he opened wide his arms…and died. And the Spirit that lived in Jesus is resurrected in all of us who decide to live the new story. Jesus is with us today as he will be through the end of time. ALL: In the same way, Jesus took a cup of wine, said the blessing and gave it to his friends saying: take this all of you and drink it. This wine is you; this wine is me. We are one blood, the presence of God in the world. When you do this, remember me and all I have taught you. Presider: God of Love, grant us peace in our day. In your mercy, keep us holy in your sight and protect us from all anxiety and fear. We watch and wait, discerning signs that You are continually with us. Presider: Let us offer each other the gift of peace. Presider: Loving God…All: you call us to Spirit-filled service and to live the Gospel of nonviolence for peace and justice. We will live justly. All: When we share in this meal, we who have always been worthy, commit to live your teachings, dear Jesus, and to tell your stories that allow Spirit to rise up within us and empower us to bring the kin-dom of God to this world. This is the good news of salvation. Presider: Let us share and spread this good news!